My first speciality coffee in New Orleans came courtesy of Spitfire Coffee. A tiny spot in the heart of the French Quarter, it’s the number one option when you need decent coffee during a hard day’s sight-seeing. Given its size/location, Spitfire could be forgiven for serving a middle-of-the-road espresso blend and a big flask of drip coffee to go. But no, Spitfire is cut from a different cloth. The coffee comes from a cast of five roasters, with a different option on espresso every day, coupled with multiple options on pour-over using V60 or Chemex. There’s also cold-brew, a decent selection of tea and some signature drinks (Las Tres Flores and a Cuban Cortado). You can also have an iced espresso or latte should that take your fancy and, refreshingly, there’s no batch-brew on offer. If you’re hungry, there’s a choice of two cakes, baked at Spitfire’s sister location, Pax. Spitfire Coffee (not to be confused with Glasgow’s Spitfire Espresso) is on Saint Peter Street, just around the corner from Jackson Square in the heart of the French Quarter in New Orleans. Sandwiched between a cigar shop and somewhere selling souvenirs, it’s a tiny spot, with the door on the right and a window on the left. There’s not much more inside, where the counter occupies maybe half the space, although a high ceiling gives Spitfire a surprising sense of space on the rare occasion it’s not full of customers. The only natural light is from the door and the tall, thin window. Coupled with the narrow, high-sided street, this means it’s subdued inside, making the extensive lighting rig above the counter a necessity rather than a luxury. Talking of which, rather than running directly across the space, the counter is L-shaped, the short side at the back, facing the door. You’ll find the till here, with the menu on the wall to the right, plus a choice of two cakes (a cinnamon bun or canele during my visit, baked at Spitfire’s sister location, Pax Treme). 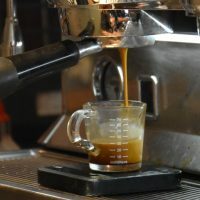 The shiny bulk of the espresso machine is immediately to your left, on the long part of the L, while you double back on yourself to collect your coffee, which appears at the top of the L. Take a look at the gallery if that doesn’t make sense! It’s mostly standing-room only, with only a few persistent folk like me staying to drink their coffee, competing for one of the three stools lining the narrow bar against the left-hand wall. If you can, I recommend occupying the one nearest the counter for an awesome view of the espresso machine. And while you’re there, it would be rude not to talk with your barista (the lovely Marissa while I was there, along with her equally lovely colleague, Meg, who was operating the till and making pour-overs). Spitfire is a multi-roaster, always trying to have five roasters represented on the menu. These are a fairly consistent cast, although every now and then, a new one joins the fold, which was the case when I was there, a Colombian single-origin from South Carolina’s Methodical gracing the hopper. Marissa told me that Spitfire tries to have a different coffee on espresso each day, making the change overnight, but recently Spitfire had been very busy, so she had been running through the coffee more quickly. Case in point, I had one of the last shots of the Colombian in my morning cappuccino before Marissa switched to a Guatemalan single-origin from BeanFruit, a roaster from Jackson, Mississippi. Spitfire champions roasters from the south, with Panther Coffee (Miami), Onyx (Arkansas) and Crema (Nashville, Tennessee) all making an appearance on the bill that day, along with Passion House, which is the exception that proves the rule, hailing from Chicago. My cappuccino, by the way, was lovely, rich and creamy, the coffee and milk in perfect harmony, the ideal start to my day. You can also see what I made of Spitfire’s sister location, Pax Treme, which opened the week of my viist. Talk about good timing! This entry was posted in Cake, Coffee Shops, Evening Opening, New Orleans, Retailers, Saturday Short and tagged BeanFruit, Crema, include, Methodical, Onyx, Panther, Passion House by Brian Williams. Bookmark the permalink.